Browse through some of our most frequently asked questions or ask a question at the bottom of the page. How does nQuery licensing work? 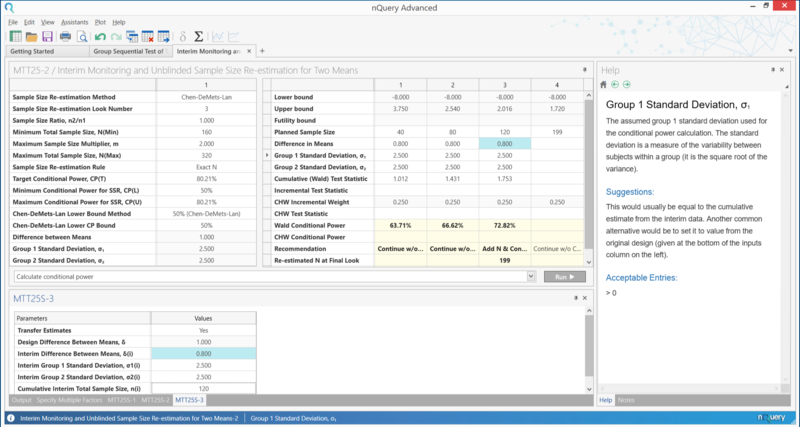 nQuery is the worlds leading sample size calculation software to help you complete a successful clinical trial. nQuery is available through tiered licensing system. 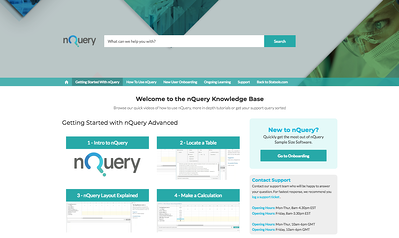 nQuery is available in different tiers. For full information of what you receive in each tier, please see the information on this page. - Difficulty opening from the desktop Icon i.e program won't open. - New activation key appears to complete activation but nQuery will not open or flashes once and closes. - Pop up window with a white X on a red background, saying “operation completed successfully” clicking “ok” closes it but nQuery still does not open. 2. Scroll down to Statistical Solutions Ltd Folder open that and in the folder marked nQuery. 3. Scroll down until you see the Util folder, open that. 4. Scroll down to the Remake application double click that to open and enter the activation key in the prompt screen. 5. It will warn you that you are about to remake the license and reactivate through the server please enter the activation key and click activate. 6. It should then allow access to the program. What is nQuery Onboarding / Training? nQuery Onboarding is online training run by our Sample Size Experts to help users get the best out of nQuery. Onboarding is updated for every new release (2 new releases every year) and is the best way to get in-depth knowledge of new features and releases. The Named User cannot regularly ‘swap’ or ‘transfer’ the nQuery License to another computer or Named User. If you need to transfer your nQuery License to another computer or Named User from time-to-time (for example, due to the replacement of computer hardware or personnel changes) please follow the Transfer License procedure and alert your nQuery Account Manager if there is a new Named User. Named User License transfers are only allowed between Named Users of the same organization (i.e., transfers are not allowed across different organizations). The named user transferring the application must deactivate any and all active installations of the application before the transferee can activate the application. A Named User License may not be transferred to a new Named User more than once in a year. Can I purchase a Network License? Yes it is possible to purchase a Network License. Please contact sales@statsols.com for more information on Network Licenses. It seems like I cannot access some features in nQuery. What is the problem? nQuery is sold in a modular format, which means that the features to which you have access to depends on your licensing. Please contact sales@statsols.com or your Account Manager for more information. How do I cite nQuery in our documentation? Do I need administrative privileges to install nQuery? Yes, you need administrative privileges to install and update nQuery. What are the minimum System Requirements for nQuery Advanced? MINIMUM (known) system requirements for nQuery Advanced. Windows 10, then it must be higher than version 1511. -Please note that Windows 10 S is not supported. Does nQuery work on virtual machines? By default, the standalone version of nQuery doesn’t work on virtual machines (VM) as the license is without VM support. However, we can create VM supported licenses on a need basis. Please contact sales@statsols.com for more information on VM supported licenses. Is nQuery available on Apple machines? nQuery is not natively supported on Apple machines without buying a virtualization product like Parallels. Is there Installation Qualification (IQ) and Operational Qualification (OQ) available for nQuery? Yes there is IQ and OQ available for nQuery. This is available in the installation package. How do I purchase nQuery? Fill in the request a quote form or talk directly to a member of sales team via live chat or phone. Our sales team will go through the different pricing option and provide you with formal quotations as well as links to purchase nQuery directly online with credit card. We accept purchase order, check or bank transfer. This document sets forth the terms and conditions of the license and the limited warranty for nQuery. Proceeding with this installation constitutes your acceptance of this license agreement with respect to all accompanying nQuery software received by you. If you do not accept this agreement, you may cease the installation within 10 days of receipt of installation key and your money will be refunded. THIS LICENSE AGREEMENT is made and entered into by and between Statistical Solutions Limited, an Irish registered company, hereinafter referred to as “LICENSOR”, and you, hereinafter referred to as “LICENSEE”. WHEREAS, LICENSOR has ownership rights of nQuery (“SOFTWARE”) and LICENSEE desires to obtain from LICENSOR, and LICENSOR desires to grant to LICENSEE, a license to use the aforementioned nQuery. Subject to the provisions contained herein, LICENSOR grants to LICENSEE a non-exclusive, non-transferable license for the use of SOFTWARE (“LICENSE”) which shall not and will not be copied by the LICENSEE and will not be passed by the LICENSEE to any other person or party, or will the whole or any part of it be disclosed by the LICENSEE to any other or party. Unless otherwise specifically agreed in writing by the LICENSOR, SOFTWARE may be used solely by LICENSEE. No title or ownership rights to SOFTWARE are transferred to LICENSEE by this Agreement. LICENSOR agrees to provide maintenance for SOFTWARE for the duration of this Agreement. MAINTENANCE includes the following services and materials. Updates and improvements to SOFTWARE, as these become available. Reasonable written or telephone consultations. Maintenance will be provided only for the release of SOFTWARE which is current at the time maintenance is required. LICENSEE agrees that it will maintain SOFTWARE (including any future forms of SOFTWARE provided to LICENSEE) in confidence. LICENSEE agrees not to knowingly provide, distribute or otherwise make available, in whole or in part to those outside of LICENSEE’S site, SOFTWARE, or any derivative thereof, including without limitation program listings and code. All terms and conditions of this Agreement shall be binding upon purchase of LICENSE by LICENSEE. LICENSEE, for and in consideration and as a condition of purchasing this LICENSE, hereby agrees to pay over to LICENSOR an annual fee. 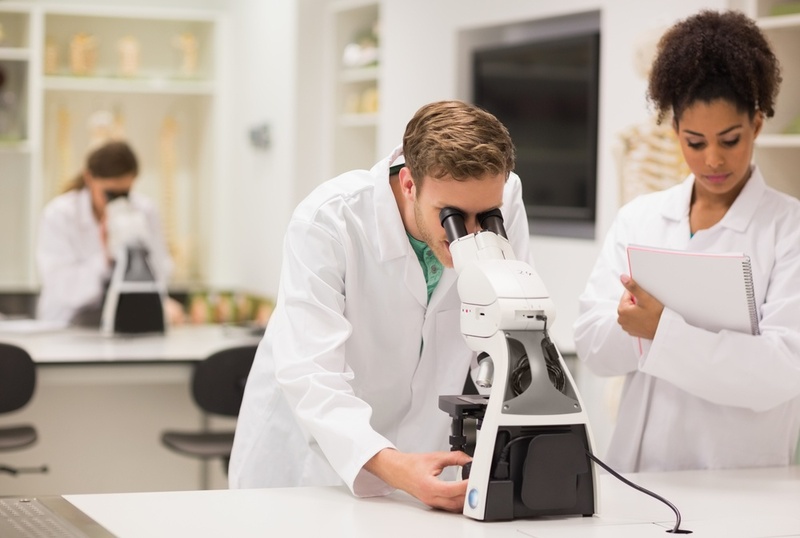 The yearly fee in effect will become due unless LICENSEE has properly exercised its right to terminate this Agreement pursuant to paragraph V.B. below. This Agreement shall become effective upon purchase of LICENSE by LICENSEE and shall remain in effect for an initial period of one (1) year, and thereafter shall be automatically renewed for successive periods of one (1) year, unless terminated as provided in this Agreement. LICENSEE or LICENSOR shall have the right to terminate this Agreement, at the end of any licensing period upon written notice, which shall be given to the other party at least sixty (60) days prior to the expiration of the yearly licensing period. In the event that notice of termination is not given by either party at least 60 days prior to the expiration of the license periodthe Agreement shall be deemed effective for another one year. Either party shall have the right to terminate this Agreement at any time upon violation by the other party of any of the provisions of this Agreement. Upon termination, of this Agreement, LICENSEE shall destroy all installations of SOFTWARE, LICENSEE shall promptly forward written notice to LICENSOR that all programs and materials containing SOFTWARE have been destroyed and are no longer in use or usable by LICENSEE. LICENSOR warrants that it has the right to grant this License. Both parties hereto agreeing that this is not a consumer contract, LICENSOR warrants that for sixty (60) days after purchase of LICENSE by the LICENSEE, SOFTWARE shall reasonably perform in accordance with the accompanying documentation (manuals and computer aided instructions). LICENSOR specifically DOES NOT warrant that SOFTWARE will operate uninterrupted or error free. Correct demonstrable and significant program errors. Provide or authorise a refund. THE LICENSOR’S LIMITED WARRANTY SET FORTH ABOVE IS IN LIEU OF ANY OTHER WARRANTIES. LICENSOR DISCLAIMS ANY IMPLIED WARRANTY INCLUDING, BUT NOT LIMITED TO ANY IMPLIED WARRANTY OF FITNESS FOR A PARTICULAR PURPOSE OR MERCHANTABILITY. LICENSOR DISCLAIMS ALL OTHER WARRANTIES INCLUDING, BUT NOT LIMITED TO, THOSE MADE BY DISTRIBUTORS OF LICENSOR’S SOFTWARE, BUT DOES ATTEMPT TO DISCLAIM OR EXCLUDE LIABILITY FOR PERSONAL INJURIES WHERE THE LICENSOR HAS AN OBLIGATION FOR SAME UNDER LAW. In no event shall LICENSOR become liable to LICENSEE, or any other party, for any loss or damages, consequential or otherwise, including but not limited to time, money or goodwill arising from the use, operation or modification of SOFTWARE by LICENSEE. LICENSEE further agrees to indemnify, defend and hold harmless, its agents or employees from and LICENSOR against all loss or expense resulting from liability of any nature arising or resulting from the acts or omissions of LICENSEE, its employees or agents, in its use, possession or operation of SOFTWARE. If any of the provisions, or portion thereof, of this Agreement is invalid under any applicable statute of law, they are to that extent to be deemed omitted. This Agreement shall constitute the entire agreement between the parties hereto with respect to the subject matter hereof, and shall supersede all oral, promotional or advertising presentations. This Agreement may not be modified except in writing signed by an authorised representative of LICENSOR. The prevailing party in the legal action brought to construe the terms of or enforce this Agreement shall be entitled to reasonable legal fees and costs. Under no circumstances shall this Agreement or any of the rights granted to LICENSEE hereunder be sold, assigned or sub-licensed, voluntarily or by operation of law, to any other person or entity, and any such purported sale, assigned or sublicenses shall be void. This agreement shall be governed by the laws of Ireland and the parties agree to the exclusive jurisdiction of the Irish Court. Unable To Find The Right Information? Have a more detailed question about nQuery?